The military camera that enabled them to see the fighting close-up is designed to detect thermal radiation, including body heat, from a distance of over 30km. It is sanctioned as a weapon under international law because it is used for long range surveillance, and often connected to advanced weapons systems to lethally target enemy positions. It is this weapon that Mosse has adapted and used to trace the journeys of refugees and migrants from Syria, Iraq and Afghanistan, as well as Senegal and Somalia. 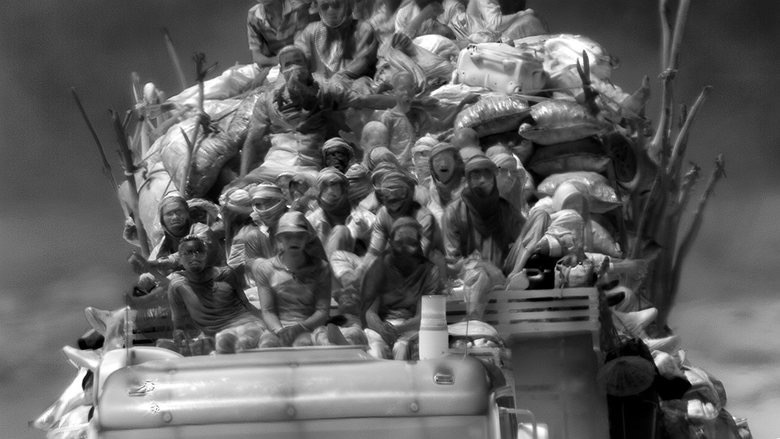 To enter Mosse’s vast triple-screen installation, Incoming, in the Barbican’s Curve gallery, is to be transported to a world both alien and familiar; a spectral place where all that we have seen of the refugee crisis in the media – overcrowded boats, rescue teams, refugee camps, lifeless bodies washed up on tourist beaches, discarded lifejackets – is rendered more visceral but more unreal. In tonal monochrome, humans appear as ghostly figures, their faces glowing eerily as the camera records traces of sweat, saliva and moisture. The world around them, whether the vast undulating sea or the makeshift streets of the “Jungle” camp in Calais, teeming with displaced humanity, seems Ballardian in its relentlessly grey otherness. It is a world not so much turned upside down as inside out: the dancing flames of a campfire on a mountainside seem almost liquid, the smoke bubbling like water; the moon ripples in the sky like a circle of silk amid fabric clouds; a man douses his head in milk-like water. It takes a while to adjust to the disorienting otherness of Incoming – the vast screens that overwhelm you with their imagery and the ominous ambient rumbles and drones created by electronic composer Ben Frost. The ghostly figures that pass before your eyes seem weighed down by gravity’s pull until you realise that the camera records everything at a slightly slowed-down speed. The narrative loosely follows the refugee trail from east to west, but Mosse is a master of constant, jarringly disruptive shifts in tone, echoing the confusion and desperation unfolding on screen. The film moves between the dreamily meditative (a lone man praying quietly to Mecca) and the horrific (children being hauled off a rescue dingy like limp dolls). There are interludes in which you glimpse the nature of modern warfare: men fixing Hellfire missiles to a fighter plane on the USS Theodore Roosevelt in the Persian Gulf, the heat of the plane’s engine glowing like an augury of destruction. More affecting are the moments of human drama, such as the terrible confusion of a makeshift field hospital as medics try to resuscitate hypothermic children pulled from the sea off the coast of Lesvos. In textural close-up, the camera recorded the imprints left by the heat of living hands on cold dead flesh. It is an image that lingers long afterwards, as does the sound of increasingly agitated voices as the screen falls into darkness. Later, we witness an autopsy in close up as doctors remove the humerus of a child whose decomposing body had been washed up on a shore after weeks at sea. The bone will be ground down and used to try to identify the victim by matching the DNA with blood samples taken from survivors and people living in the region from which the victim fled. 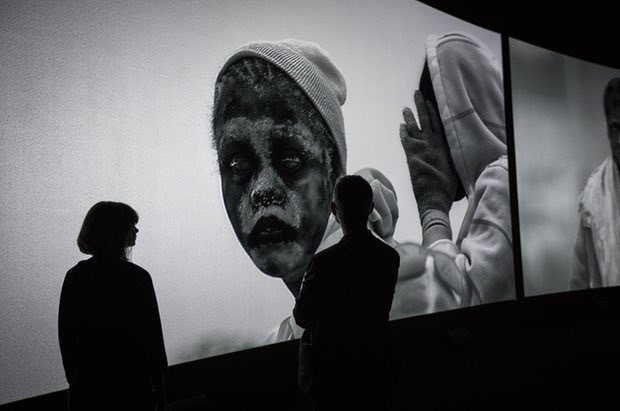 In all of this – as with Mosse’s previous project The Enclave, which used an infrared night camera to render the war-torn landscape of the Democratic Republic of the Congo in vivid pink – one must ask the inevitable question: does an artwork that sets out to challenge documentary tropes end up aestheticising human suffering by rendering it mere spectacle? 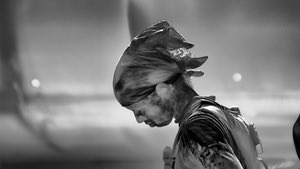 The tension between the wilfully unreal textural beauty of the film – and it is pure texture, from start to finish – and the human tragedy it records is undoubtedly part of its power, making it uncomfortable viewing in the context of an art installation. The astonishing intensity of his film means he has succeeded. This, Mosse reminds us, is a human tragedy – our human tragedy. We are all implicated in its unfolding. I was left with the image of a lone man praying in the darkness, his luminous calmness echoing against the confusion and chaos around him; his aloneness, for a few moments, his sanctuary. 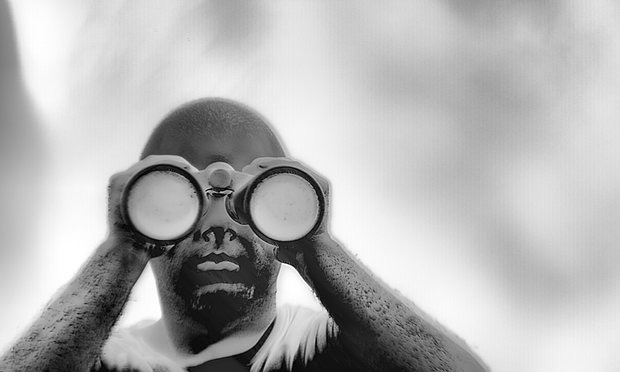 Richard Mosse: Incoming is at Barbican Curve, London, until 23 April. A book, Incoming, is published by MACK. By Sean O’Hagan, Reprint from TheGuardian, 15 February 2017, © 2017 Guardian News and Media Limited or its affiliated companies.